Honey Whiskey Trio debuted with us back in 2014 on a split bill. They have continued to get even better and now they will be back with lots of additional songs to do a full show on their own. 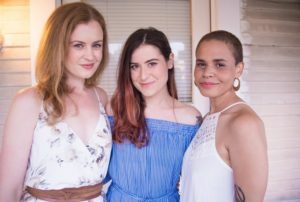 Honey Whiskey Trio are three young women who sing mostly a cappella, though they also play guitar, mandolin, and banjo, and they feature body percussion. The Trio’s harmonies are fantastic and their body slaps and foot stomps are very dramatic. They create, arrange, and explore music from the front porches, music halls, and hymn books of early America, sharing it with students, adults, and life-long music lovers across the United States. Starting with a love of folk music and an interest in jazz, the result is music, such as a version of House of the Rising Sun that you’ll never forget. Courtney Gasque, Ann Louise Jeffries Thaiss & Christina Wilson met at the Bob Cole Conservatory of Music at California State University, Long Beach and they won 1st place at the regional Harmony Sweepstakes A Cappella Festival in 2013, having only been together for four months. Then they won the national first place award four months later! Today their passion for music education, community outreach, and singing unapologetically continues to drive them. The show will be in Beckman Institute Auditorium (“Little Beckman”) at 400 South Wilson Avenue. On concert night, free parking is available in the lot behind Beckman Auditorium (“Big Beckman), but this lot may fill up, especially if there are other events on campus that night. You can always find parking for our shows in the two parking structures on Wilson Avenue, just south of Del Mar Boulevard. On weekends and after 6:00 PM, you may park in spaces that have individual names. Restrictive wording at the structures refers to weekdays before 6:00 PM. There is also parking available on Wilson Avenue itself. Beckman Institute is on the other side of the large lawn on Wilson Avenue, on the first floor of the left portion of the building. If you get to the fountain and pools that point toward the white, round, building (Beckman Auditorium, which we refer to as “Big Beckman,” you have gone too far. See this map. Beckman Institute is building #74 and the parking structures are #123 and #124. Tickets are $20 for adults and $5 for children and Caltech students. They are available at the Caltech Ticket Office by calling (626) 395-4652 and at the Caltech Ticket Office in their new location at 1200 E. California Boulevard in Pasadena (Southeast corner of Wilson Avenue). Their usual hours are 10:00 a.m. to 4:30 p.m., Monday through Friday. They are available online here. There is a fee for phone orders and for online tickets, while purchases at the Ticket Office are free. Tickets can also be purchased (without additional fee) at the door of the venue one half hour before the show, but it is always wise to call the Ticket Office a day or two before a show to ensure they are not close to a sold out show. We hate to have to turn people away, which occasionally happens! Join our mailing list and you’ll be sure to be notified about the show a few weeks ahead of time.